Ask two people how to eat a mango and get two different answers. For mango lovers, there's always a favorite way to eat this tropical treat. The first step to learn how to eat a mango is to learn how to cut a mango. Slicing and dicing a mango has flummoxed many a hungry mango lover. Mangoes appear large, but the inner portion consists of a pith or tough inner core that's not edible. When eating a mango, it's important to slice as close to the tough inner core as possible. Most recommendations for ways to cut and enjoy a mango call for slicing off the cheeks. Although that may elicit a giggle, the cheeks of a mango actually refer to the two rounded halves sliced off the fruit. Simply take a sharp knife and cut around the mango the long way, scoring it and slicing off two halves from the inner core. The sweet tangerine-orange fruit inside can be removed from the skin several ways. You can take a spoon and simply scoop it out. While messy, it gets the job done, and provides instant gratification since you can just scoop and eat the delicious sweet fruit immediately. For gourmet cooks, however, who want neat mango slices or cubes, it's best to use a sharp knife and score the mango flesh inside the cheeks. You can make thin slices or cut a checkerboard pattern into the fruit itself. Grasp the cheek in both hands and gently turn it inside out so that the scored fruit stands up. Using the knife, slice the fruit away from the peel. Discard or compost the peel and pith. You're left with neat slices of fruit suitable for a fruit salad, ambrosia, or a delicious tropical dessert. Many novices try to peel mangoes, only to have a sticky, slippery mess on their hands. A ripe mango is best eaten using the methods listed above. Peeling off the mango skin with a potato peeler is a quick way to prepare a mango, but the slippery fruit is often hard to manage. If you do decide to peel a mango, make sure you cut the flesh carefully away from the hard inner core. Be careful when using a knife, too, since they can sometimes get stuck in the pitch and break. Always wash a mango thoroughly before cutting or slicing it to avoid contaminating the inner flesh with any microbes on the outer peel. While many aficionados enjoy mango by itself, others seek to learn how to eat a mango as part of a main dish or dessert. 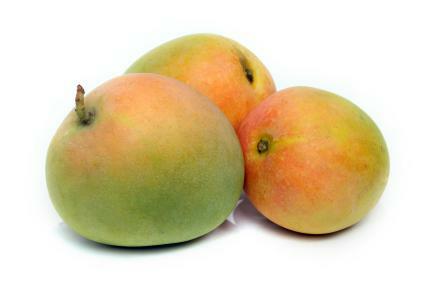 Mango is used in many cuisines, including Thai and other Asian foods. A favorite at Thai restaurants is a dish called mango with sticky rice. This dessert is popular both within Thailand and in restaurants serving Thai cuisine worldwide. It pairs salty, stick rice with sweet ripe mango and coconut milk. To make your own Thai mango and sticky rice, visit Real Thai Recipes for an authentic and fairly easy recipe. There's a lot more ways to prepare and enjoy mangoes. The world's largest mango recipe guide may be found on Fresh Mangoes. If you're mad about mangoes, you can prepare mangoes for breakfast, lunch, dinner, snacks, appetizers and desserts. Or if you're a chef and you've created a unique way of enjoying mangoes, send them your recipe. Either way you're in for a rare treat as you explore dozens of mango recipes. No matter how you enjoy a mango, when you eat one be sure to have plenty of napkins handy. Mango juice may be delicious, but leaving it on your chin isn't the best manners.